Shipping containers typically come in 20 ft. and 40 ft. lengths.The local cost for a forty foot cargo container is about two-thousand dollars. A twenty footer costs about two hundred dollars less. So in the container world, if you buy a larger one, the second half is essentially free. We opted for a “high cube” which has an exterior height of nine feet – six inches. It allows ample headroom inside and space to fur in the floor and ceiling for insulation. When complete, the interior finished space is still over 8 ft. high (we highly recommend going this route). In order to better utilize the space, we divided the building into three sections. 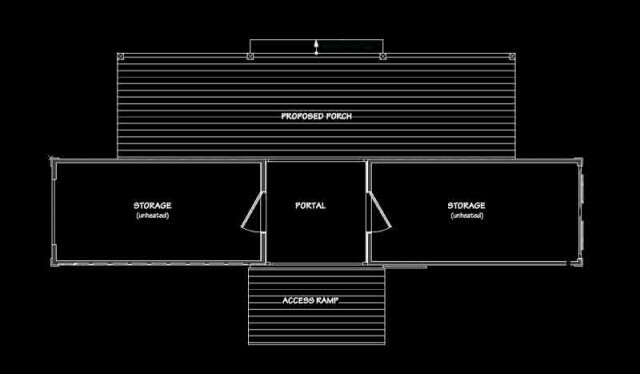 The center provides an access portal from the parking area to the garden while also providing a covered access area for the two storage compartments. We kept the original cargo doors and added a roll up utility door on the other end so that both compartments would have light and access from either end. We added a roof cover to protect the sliding door and add some interest to front the wall. Tying the building to the fence line helps to visually integrate it into the property. The large porch (hidden from the road behind the container) extends the utility of the building significantly by providing an inexpensive but dry work area. Stylistically, the curved roof is fun, but also protects the top from weather. We took the idea a little further and used the roof to protect a series of storage bunks above the rooms. Having material sorted, dry and close is perfect – plus it’s extremely compact and can store a wide range of material lengths.